[VIDEO] Turkey’s female police officers vow vengeance: May revenge be everlasting! A group of police officers was revealed to have taken an oath of vengeance that resembles an infamous march by the Grey Wolves, an ultra-nationalist youth group affiliated with the Nationalist Movement Party (MHP). 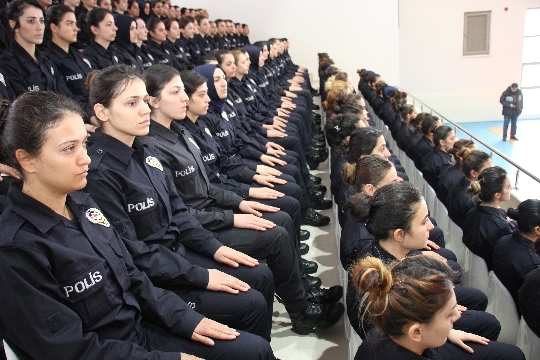 In a recent video believed to be captured in the courtyard of the Police Vocational Education Center in the central Anatolian province of Yozgat, young individuals in police uniform are seen made to take oath en masse. While details about the video are unknown, some social media users claimed that the group is consisted of new police academy graduates who completed their degrees only last week. The oath sounded like a similar but reworded edition of the Grey Wolves anthem. and our veterans remain assured! May our blood dry up if we forget! The Gulen movement was blamed for the coup bid while the Kurdish minority have seen their parliamentarians jailed over terror charges. Some 115,000 people have been detained while nearly 50,000 put in pre-trial arrest since July 15, 2016.